Developer Mark DiFranco has built a Reminders client that appears far more native to iOS than Apple’s actual native option does. Whereas Reminders’ design looks increasingly outdated after sitting unchanged for years, Reminder takes a page from one of Apple’s most recent design styles by modeling itself after the Home app. 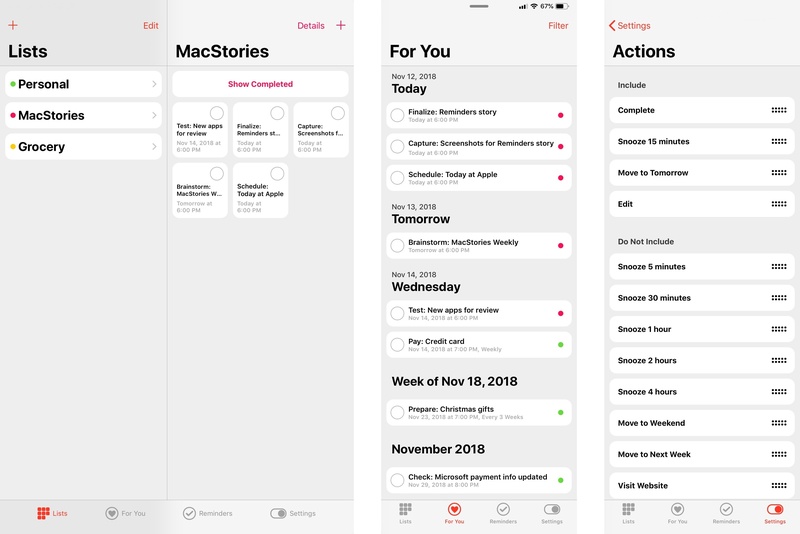 Like in Home, the interface is composed of a grid of different tiles, which in Reminder’s case represent your various to-dos.1 This tile structure is accompanied by the use of iOS 11’s big, bold headings, and there’s even a ‘For You’ section like in many modern Apple apps. Overall, the design is a drastic departure from Reminders in every way, but not so from iOS itself. Reminder’s tab bar offers three main ways to view your to-dos. The Lists tab is the place for editing, creating, or viewing individual lists. It’s also where you’ll find one of Reminder’s hidden power features: under the Details screen for a list, you’ll see options to set default time and location alerts for all future tasks added to this list. So, for example, you can cause all future tasks to automatically receive ‘This Evening’ due times, or to always alert you when you reach a certain location. Chances are low that you’ll want every to-do in a list to have the same alerts, but if the majority of your tasks do receive the same configurations, default alerts can be a helpful time-saving measure. Personally, most new tasks I create receive due dates of 6:00pm today, meaning I want to get to them by the end of the work day. Reminder allows me to save time setting that alert individually, so even when I need to delay the alert until later, I’m still configuring due times far less often than before. For You and Reminders tabs join Lists as alternate ways to view your tasks. The former is like the Scheduled list in Apple’s Reminders, providing an overview of all tasks that currently have due dates. 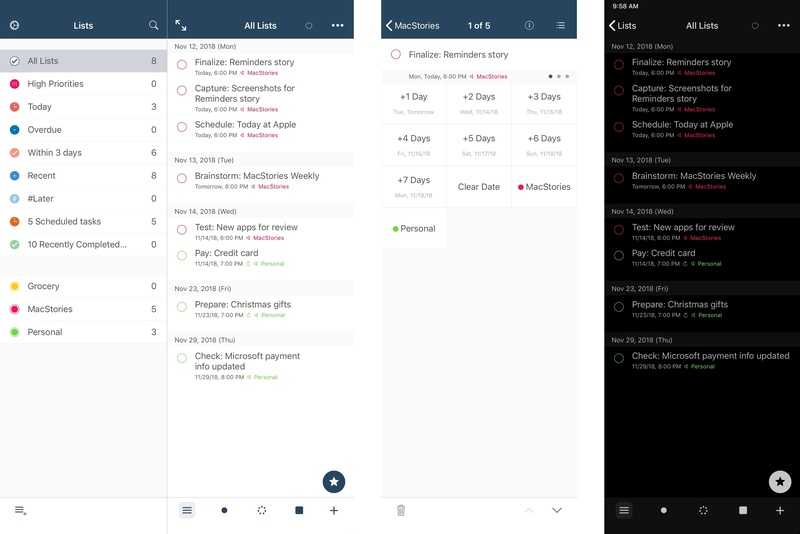 Unlike Reminders, however, where you can’t distinguish tasks from different lists inside the Scheduled view, Reminder’s For You retains the color markers that identify each list, which provides both visual flavor and practical benefit. Finally, the Reminders tab contains all your tasks, whether they have due times or not, and also offers a quick way to add new tasks to existing lists. There are three other Reminder features I want to highlight briefly. First, the app includes a dark mode that looks especially great on OLED displays. It’s rare to find a dark mode option in a task manager, not to mention one that takes advantage of an OLED’s ability to display true black, but both Reminder and GoodTask include one. Next, notifications are especially powerful in Reminder due to the way they can be customized to include the actions you value most. You can include a variety of snooze options, ranging from 5 minutes to 4 hours, or even push a task to tomorrow, the weekend, or next week. Snooze actions join those for completing or editing a task, making for a healthy assortment of options to utilize in your custom notifications. Finally, one of my favorite smaller features is how easy Reminder makes it to add due dates, location alerts, and notes to your tasks. Whether you’re creating a new task or modifying an existing one, Reminder loads what resembles an extended keyboard row where you’ll see buttons to quickly edit those three types of metadata. The app doesn’t boot you to a separate screen to modify metadata, like Reminders does, and as a result the action feels much quicker and less cumbersome in Reminder. Where Reminder is a design-focused modernization of Reminders, GoodTask prioritizes task management power features that help the app stand up with heavyweight alternatives like OmniFocus and Todoist. It starts with Smart Lists, a feature that enables customizing your view based on factors like a task’s assigned list, date status, text contained in it, and much more. Smart Lists not only let you customize which tasks you see, they also enable specifying how those tasks are presented. Each Smart List can have its own sort options, view type, inclusion of calendars or not, and also a custom icon and color. If you have a lot of tasks to manage and need fine-grained controls for organizing those tasks, Smart Lists can be an essential aid. GoodTask also includes not one, but two of my favorite methods for creating new tasks. First, it accepts natural language input to set metadata like due date, assigned list, and priority. The syntax requirements can be viewed from Settings ⇾ New Task ⇾ Text Snippets, where you can even create custom snippets that best suit you. As great as natural language input is though, the task creation feature I love even more is called Quick Actions. These are buttons you can customize to quickly, effortlessly set task metadata without needing to bother with menus or even typing special syntax. Once set up, Quick Actions live in a grid on the task editing screen, offering one-tap access to date, list, and other modification types. I have Quick Actions that alter a task’s due date by anywhere from 1 to 7 days, another that removes the due date, and also those which instantly assign tasks to specific lists. Date and list are the two parameters I most often adjust with my to-dos, and GoodTask’s Quick Actions offer the most effective way to do that, whether I’m creating a task or editing one. As I mentioned in passing, GoodTask supports integrating your calendars to stay well informed regarding what your agenda for the day looks like, and the app also lets you add tags to tasks for even greater flexibility. Features like Smart Lists and Quick Actions are just the tip of the iceberg in customization, too, as nearly every aspect of the app can be set up to match your exact preferences, including the notifications, which are even more powerful than those found in Reminder. A small, recently added feature I’m fond of is something called List Memos, which essentially just allows you to set a message that will be displayed at the top of a list at all times. Most people will probably never use it, but I’ve found it a great addition for storing important reference materials or even just inspirational quotes you want close at hand. Lastly, I must mention that GoodTask is a tremendously good iOS citizen. It’s always one of the first apps to adopt new APIs and technologies provided by Apple, such as Siri shortcuts and drag and drop. Following the recent introduction of the Apple Watch Series 4, GoodTask’s watchOS app was promptly updated with support for the new Infograph complications, and users who picked up a third-generation iPad Pro recently will have found that GoodTask had day one support for the new displays. First-party apps typically hold the advantage of implementing new OS features quickest, but GoodTask keeps right in step with Apple in that way. It’s been over five years since Apple’s Reminders last saw meaningful change, and back then it was only thanks to iOS 7 introducing a system-wide redesign. The app desperately needs a Notes-style rethinking, but each June’s WWDC comes and goes with no indication that such a modernization is ever coming. If Reminders’ stagnation is weighing on you, but you don’t want to go through the hassle of moving tasks to a whole new database, or you’d simply like to dip your toes into an app alternative without fully committing yet, Reminder and GoodTask are great options for doing that. They’re hallmark examples of what can be done to improve and revitalize Reminders, bringing Apple’s aging list and to-do app into modern times, each in their own way.